Winner in 2016, Japan’s Jun Mizutani and Korea Republic’s Jeoung Youngsik, successful one year earlier, are the two players on duty at the forthcoming Seamaster 2018 ITTF World Tour Platinum Australian Open who are past winners of the Men’s Singles event; however, it is the one player who is a defending champion on whom eyes will undoubtedly focus. Commencing in Geelong with a two day qualification tournament on Tuesday 24th July, from the very start, the name of Jang Woojin will be in the spotlight. The winner of an unprecedented three titles at the recently concluded Seamaster 2018 ITTF World Tour Platinum Shinhan Korea Open in Daejeon, he is the one and only player present in Geelong who is in any manner whatsoever, defending a title. Last year when the tournament was staged in the Gold Coast, he won the Men’s Doubles in harness with Park Ganghyeon, the pair accounting for Chinese Taipei’s Chen Chien-An and Chang Hung-Chieh to secure the top prize. Now, in Geelong it would appear that he has more than a chance of succeeding once again, he partners Lim Jonghoon the player with whom he won recently in Daejeon; the pair occupy the no.6 seeded position. Seeded in the Men’s Doubles, notably the name of Jang Woojin does not appear in the Mixed Doubles event and, as last week in Daejeon, in the Men’s Singles competition he must compete in the qualification tournament. Somewhat differently, colleague, Lee Sangsu is competing in all three disciplines and is very much in the hunt for honours. He is the no.3 seed, in the Men’s Singles event behind Germany’s Dimitrij Ovtcharov and China’s Xu Xin, whilst in the Men’s Doubles, partnering Jeoung Youngsik, he is the top seed, the same as in the Mixed Doubles in harness with colleague Jeon Jihee. In the former, Japan’s Masataka Morizono and Yuya Oshima occupy the second seeded place in the draw; in the latter it is their colleagues, Maharu Yoshimura and Kasumi Ishikawa. Notably both pairs excelled at the Liebherr 2017 World Championships, Masataka Morizono and Yuya Oshima were the runners up; Maharau Yoshimura and Kasumi Ishikawa, the winners. Notably Masataka Morizono, Yuya Oshima and Maharu Yoshimura must all compete in the Men’s Singles qualification event. 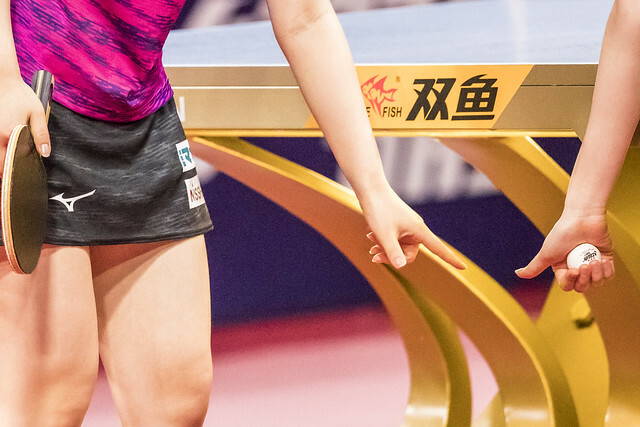 Somewhat significantly it is a tournament in which the seeded players are very much the same as in Daejeon; the exceptions being China’s Lin Gaoyuan and Hong Kong’s Wong Chun Ting. They are not present in Geelong. Next in line to Lee Sangsu is Japan’s Koki Niwa followed colleague Tomokazu Harimoto and Brazil’s Hugo Calderano. Frenchman, Simon Gauzy, the runner up one year ago when beaten by Vladimir Samsonov, is the no.7 seed, with Jun Mizutani, Kenta Matsudaira and Chinese Taipei’s Chuang Chih-Yuan the next on the list.